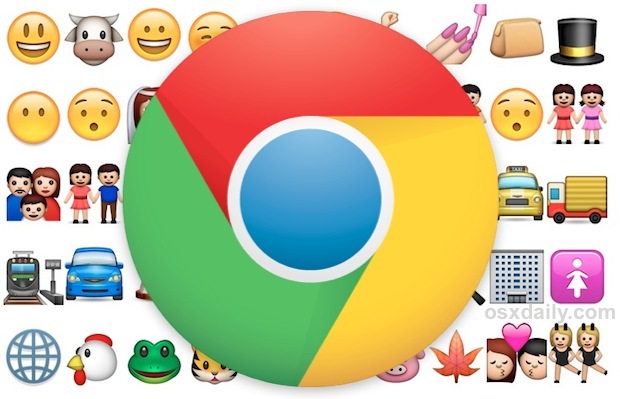 Chrome users may have noticed that the popular Emoji characters found on iPhone and the Mac render just fine in Apple’s Safari web browser of OS X, but not in Google’s Chrome browser. Instead, us default Chrome users on the desktop will see a square rendered 😃 rather than the intended emoji character, largely being left out of the emoticon fun. That can be quickly changed by installing a free third party extension called Chromoji, which makes those same snazzy emoji characters visible within the Chrome desktop browser of OS X, Windows, and even Linux. The emoticons above should now be visible in the Chrome browser of any operating system. Mac users can now type out the emoticons by using the familiar Special Characters menu option to access Emoji just like is possible from any other app. Windows users and Chrome users can also now type using the same Emoji keyboard and font by accessing the Chromoji toolbar item. The developer of Chromoji notes that they should work almost everywhere in Chrome, whether it’s the general web, Twitter, or a Facebook wall, but apparently Facebook Messenger still does not display them properly. This is obviously mostly for eye candy, though tons of people use emoji interspersed within their messaging and online discussion, just don’t expect to find some extreme usefulness here. Overall, it’s a fun way to enhance the web browsing experience for Chrome users until the browser starts supporting the Emoji keyboard natively. TurboTax does not work with Google Chrome?